Well my layout is standard gauge, 'O' Scale and three-rail - but, with the latest sound equiped engines, it also goes "Choo-Choo". 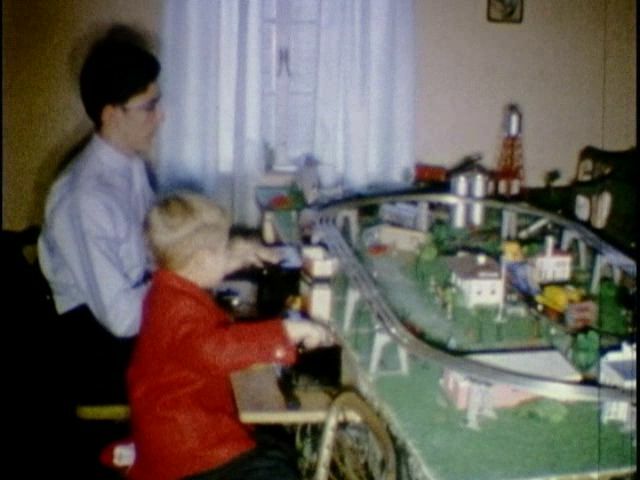 No surviving photos of this Christmas but my father told me that he first bought me this train set when I was 2 years old in 1950. 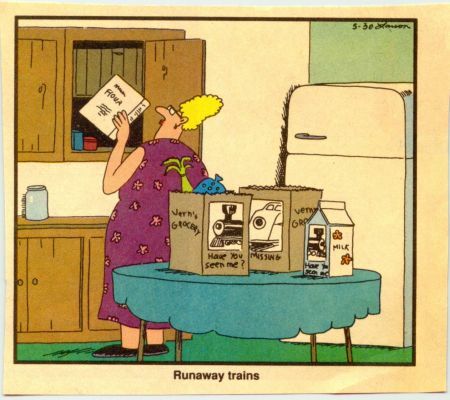 I have very early memories of this train running around a loop of track under the Christmas tree. 1950 Lionel train set (photo taken in 2012). This was not a catalogued set and was most likely just put together by (probably) Sol's hardware store in Aliquippa, PA. The 2046 was classifed as an 027 locomotive by Lionel but I always had O gauge track. 2046 years of production were 1950-51 and 1953. Mine was an early production version with three windows made from 1950 to 1951. I had a 1033 transformer and a UCS uncoupling track. 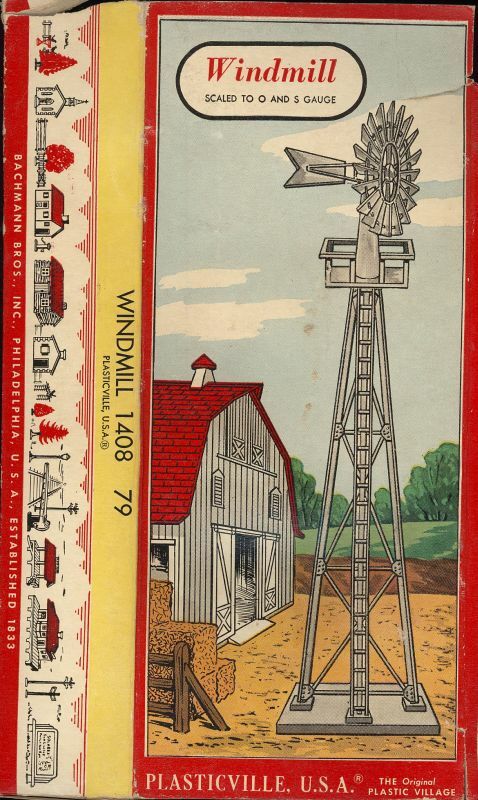 In the 1950 Lionel catalog, the 2046 sold separately for $32.50 ($316.61 today). 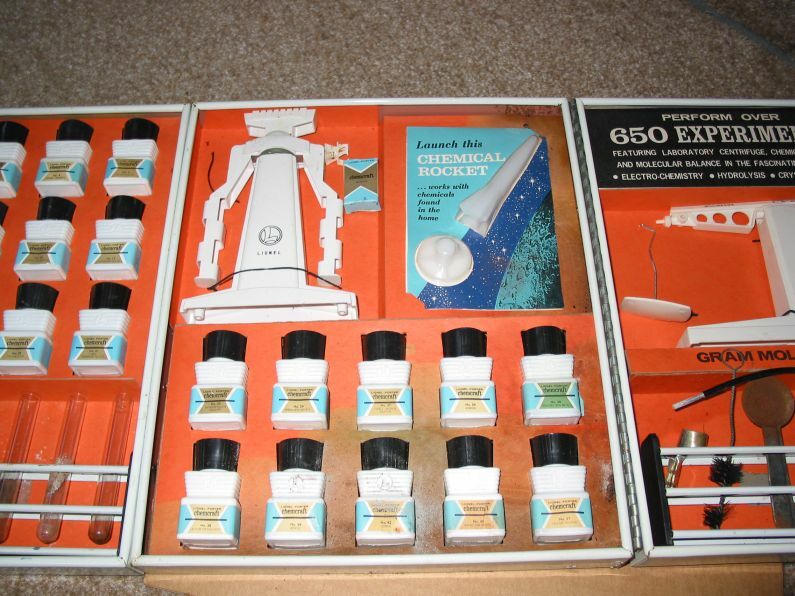 An 027 set similar to mine, the 1473WS sold for $49.50 ($482.23 today). 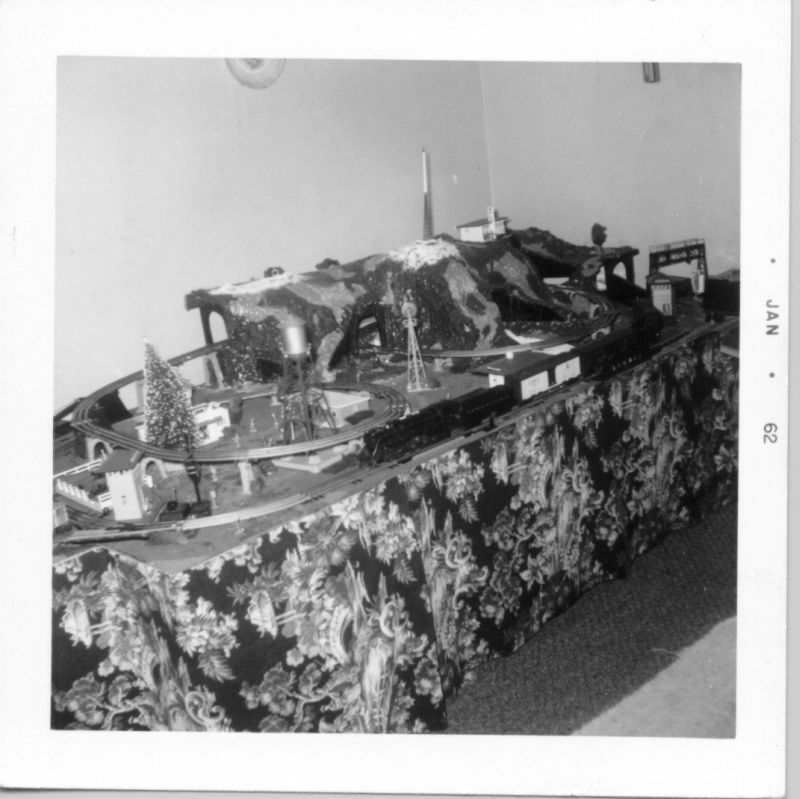 Though you can't tell from this Christmas 1956 photo, I just received a Lionel 3356 Horse Car and Corral and a 3662 Operating Milk Car. The Horse car was new for 1956, the Milk car had been cataloged since 1955. I remember going to Sol's Store in Aliquippa before Christmas and seeing those two cars. I couldn't decide which one I wanted Santa to get me. My mother said - "we'll just see which one he brings". Well, he brought them both! There were no train tracks under the tree so I must have had a layout on a sheet of plywood by this time. 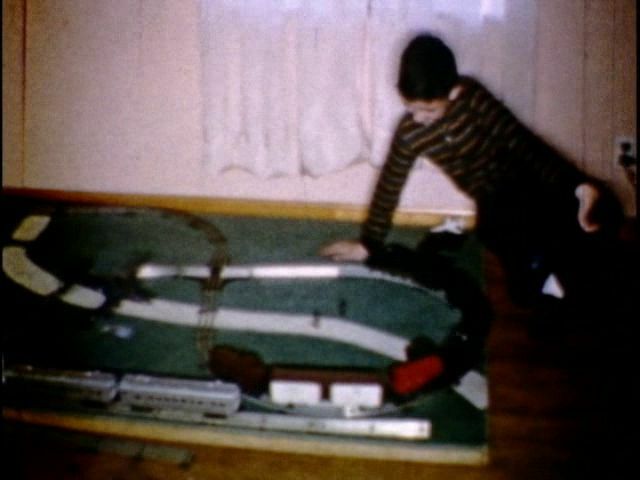 Notice the curtains behind the tree - a few years later (see photos below) they became the skirting for my train table. 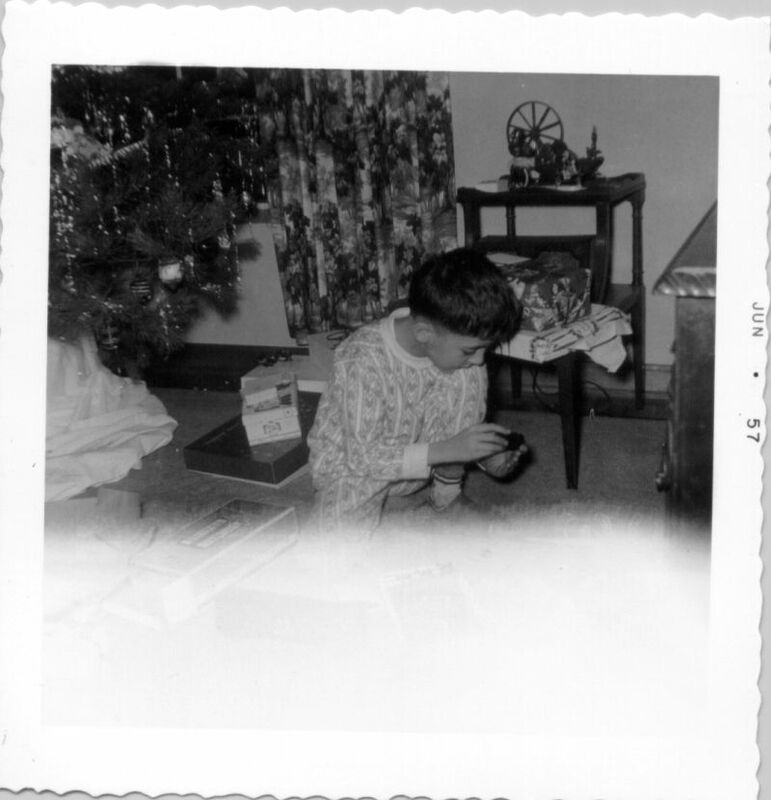 Sometime in the late 1950's (probably 1957 or 1958), my father accidently stepped on, and broke, some gift that I had received. I don't recall what the gift was - some kind of toy. I guess he wanted to make it up to me so he took me to a hardware store in Monaca, PA. It might have been Balamut Electric Shop at 1213 Pennsylvania Ave in Monaca. This must have been summer time, maybe after my birthday. Anyway the store just had leftover toy train inventory - stuff no one wanted. I ended up with two Lionel 2429 Livingston Passenger Cars - I was happy to get them as they were the only passenger cars I ever had as a child. As it turns out, the 2429 were not popular cars, they were only cataloged for 2 years 1952 & 1953 and today are two of the most valuable passenger cars that I own. And of course, this gift was way better than whatever it was my dad stepped on! I've since bought the other three cars in this series, the 2421 Maplewood Pullman, the 2422 Chatham Pullman and the 2423 Hillside Observation Car. 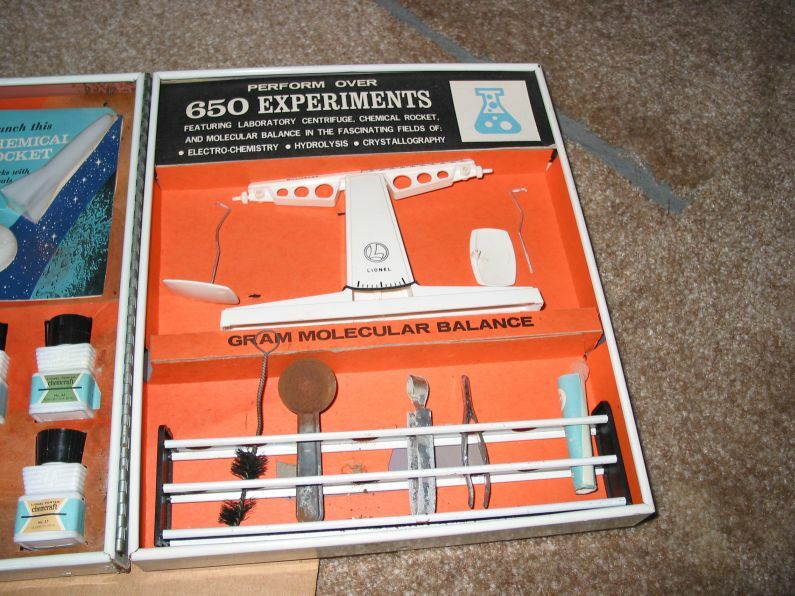 Also around the late 50's I received the one gift that every red-blooded American boy wanted. A toy that could lead to unimaginable mayhem, death and destruction. I don't mean a "An official Red Ryder Carbine-Action 200-Shot Range Model Air Rifle With a Compass in the Stock" .... but rather a Lionel 090 Crossing track. Video capture from old 8mm film. It was a figure 8 with a crossover. On a 4x8 piece of plywood, on the floor. 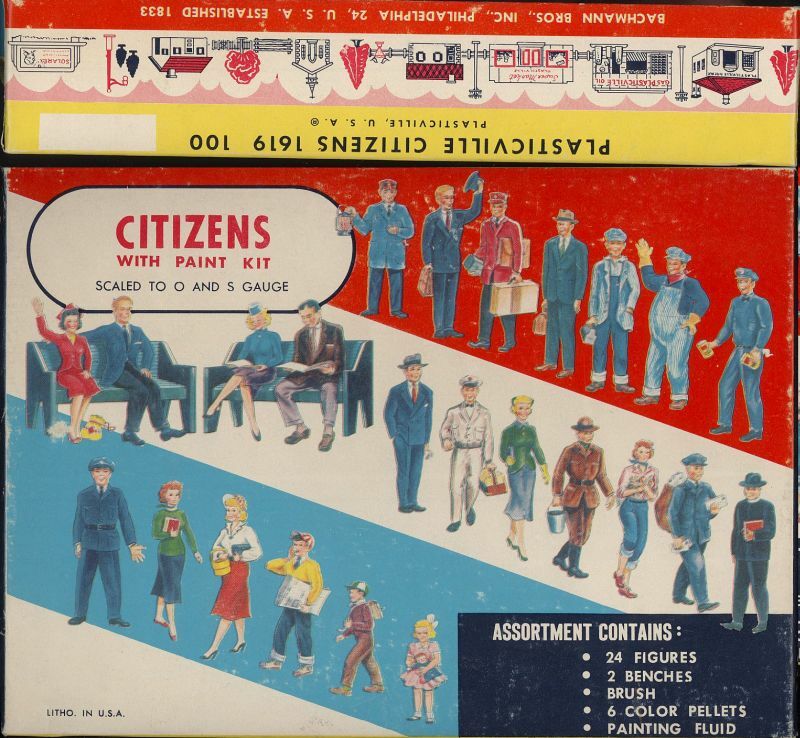 Back in the 1950's we kids called this our "train board". My dad made it and painted it green with a road across it. No Plasticville yet but I had a 90 degree crossover track. 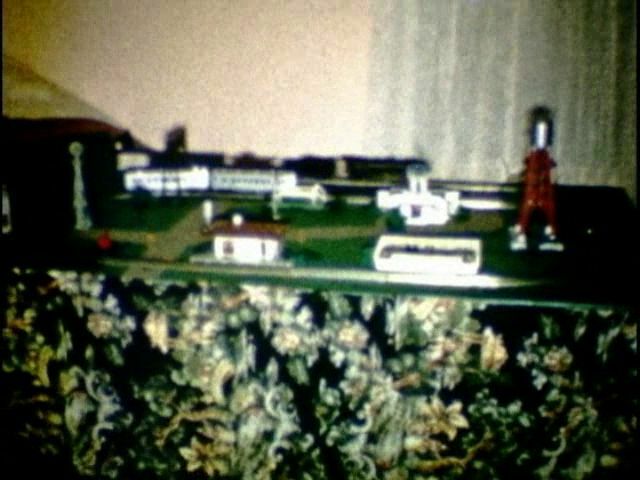 You can see the Horse Car/Corral and Milk Car that I received from Santa in 1956. At the left-bottom, are 2429 Livingston Pullman Passenger Cars on the siding. This layout took over the dining room and we ate Christmas dinner in the kitchen. The trains were only allowed to be out around Christmas. They got packed away in January, there to remain until usually just after Thanksgiving. 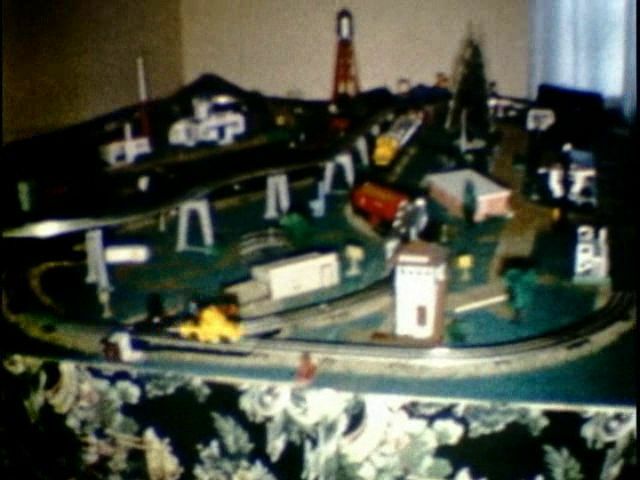 They weren't hidden so I would go down into the basement every few months and check the closet to make sure they were OK.
On this layout, you see my original Plasticville (see the story below). This must have been the first year that the layout came up off the floor. I think by this time, I had two 042 manual switches. My family couldn't afford 022 remote control switches. The 193 blinking water tower shows up for the first time in this photo. 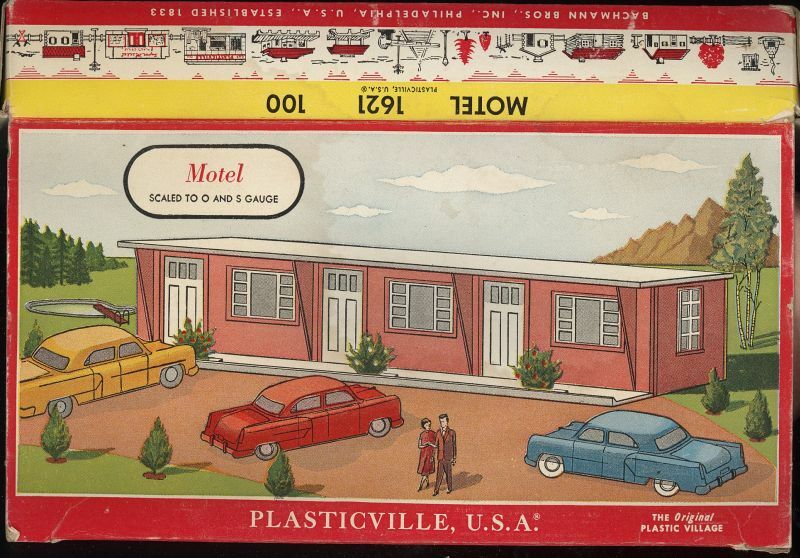 And this is the first year that my Plasticville buildings appear. An under and over layout using a Lionel 110 trestle set. I was in 7th grade. 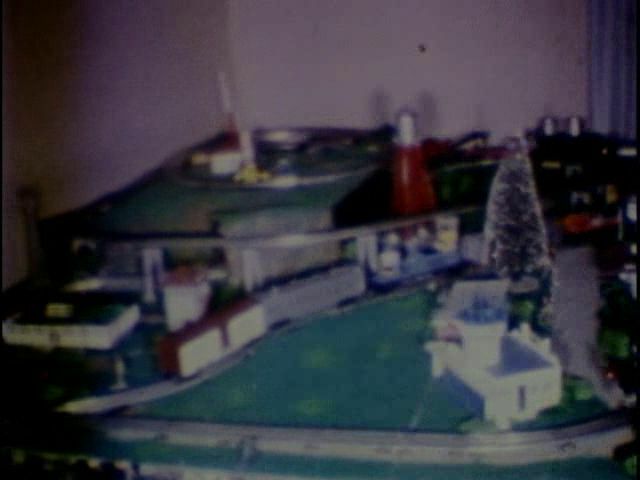 I still have all this equipment but the layout lasted only during the 1961 holiday season. The tunnel portals were made from the pine wood that fashioned the crates for grapes that my dad used to make wine. Mountains made out of plaster. 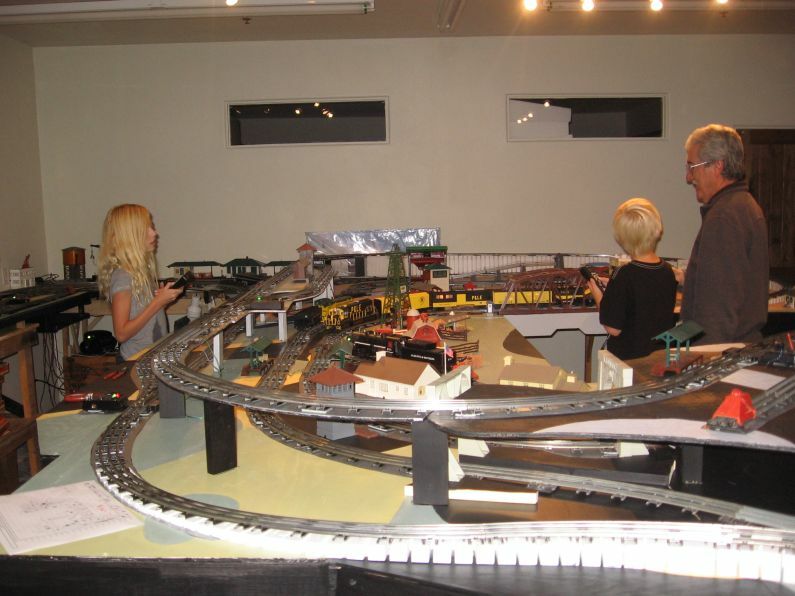 This year, the layout grew with the addition of a 2x8 piece of plywood. 65 handcar just going over the swtich. The feet of the men on this car eventually ate through the plastic body. 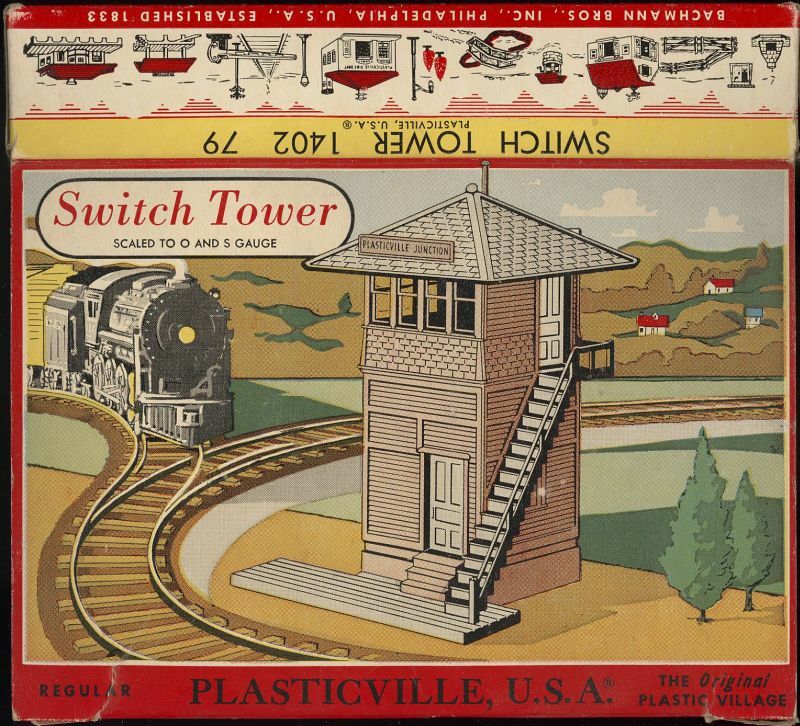 This one had a second level, a loop of track around a Plasticville TV Station with a 65 handcar going around and around. With our next door neighbor, John Kish. 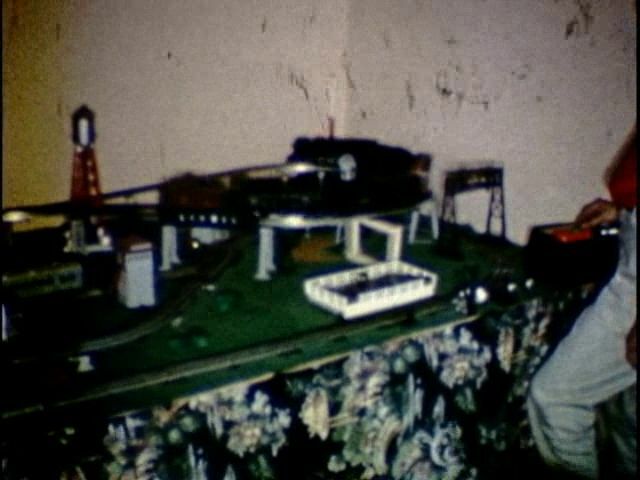 You can see the 3545 Operating TV Monitor car that I got from my Uncle Paul and Aunt Maxine. And there's the 54 Ballist Tamper that survied my experiments at the crossing track. My last layout for almost 3 decades. My collection sat in boxes through high school, college and the Army. My parents made me get it out of their house in the middle 70's. It wasn't until the early 80's that I was able to put up some shelves in my condo to display some of it. In the condo (in San Diego) there was no room to set up a layout. I moved into my first house in 1986. I put up the display shelves in the den. 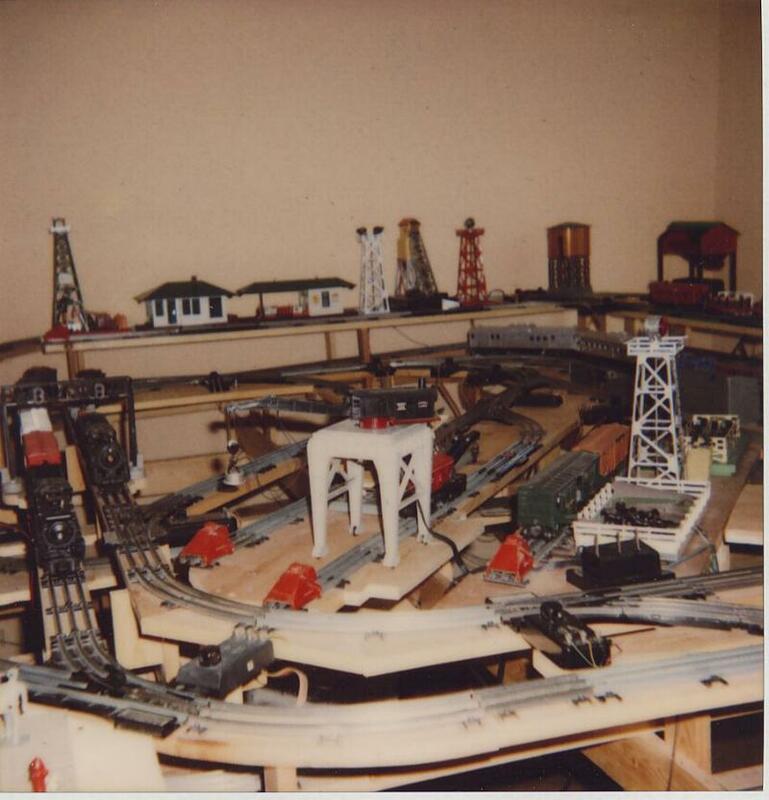 In 1992 I started on a real layout for the first time of my adult life. I took over a bedroom in my house. I was still single at the time. Lasted until 2006. I never got to any scenery or Plasticville. I realized that the 1992 layout was too "complicated". Too many levels and too many accessories. 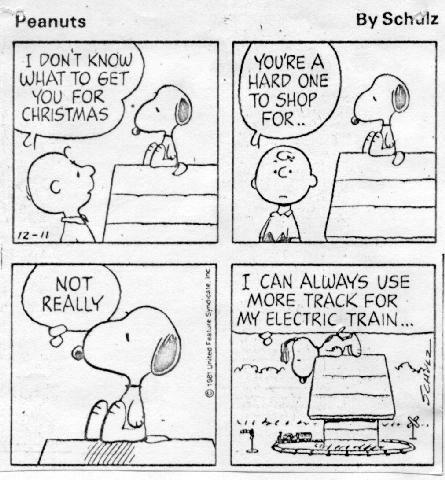 And too hard for me to reach all the track. I tore it town and restarted. The new layout was one level, with two lift out bridges. Nothing was more than 2 feet from an aisle. Still no scenery! We moved into a new house in 2009 so the layout came down, was packed up and moved. In our new house, I had more room and a real train room rather than just a bedroom. I took over the rear of a two car garage. Still room for our cars. 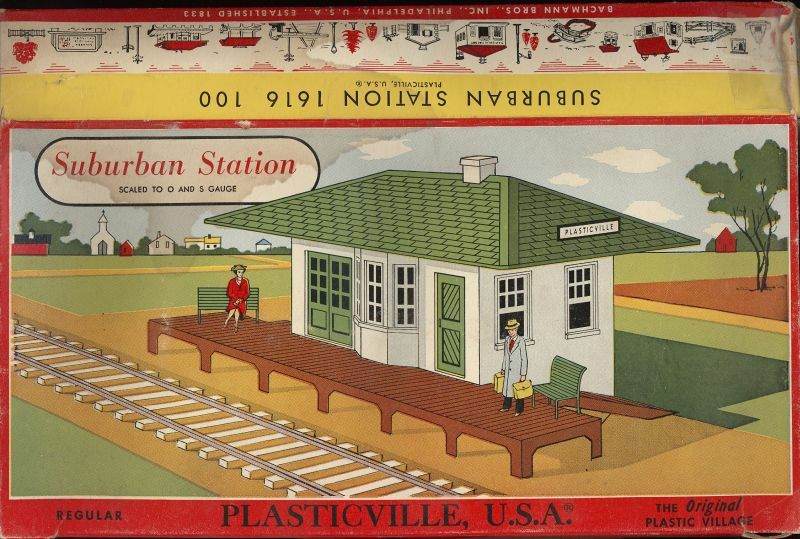 My uncle, Paul Frazzini, figures into my story about my Plasticville. All of the pieces that you saw on the early layouts came to me as a Christmas gift from my uncle Paul. 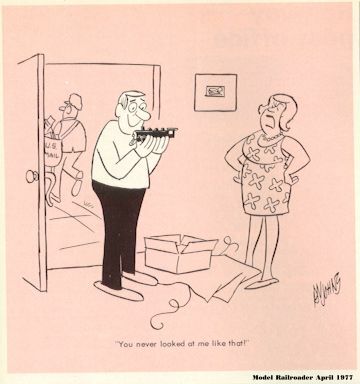 For Christmas 1958, he first bought me a gas powered airplane. The kind where you hold a string control line and the airplane flies in a circle around you. We spent most of Christmas day trying to get the engine to run. It never did. We never flew it. 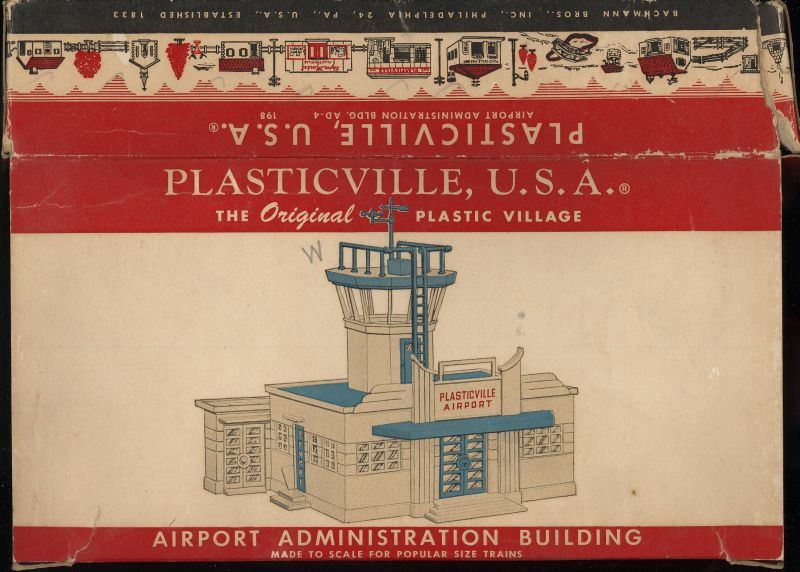 A few days later, we returned the airplane to the store in Beaver Falls and in its place, he let me buy all the Plasticville you see in the photos. As it turned out, this was a MUCH better gift. 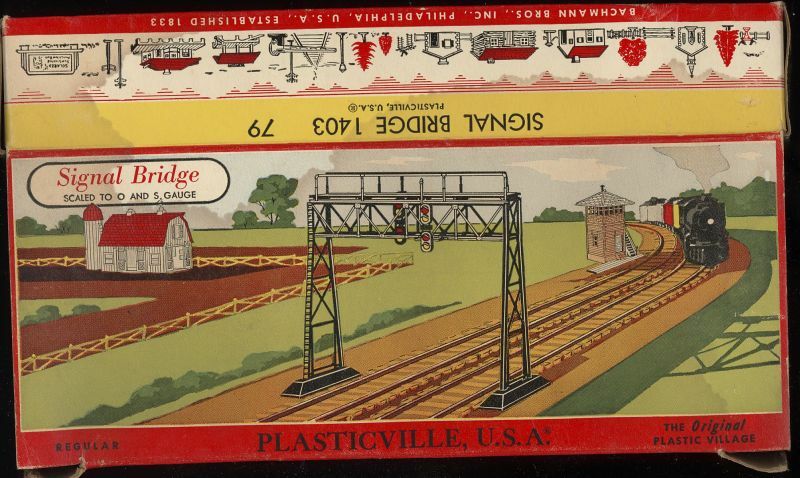 Plasticville is still manufactured by Bachmann. Click here for their web page. 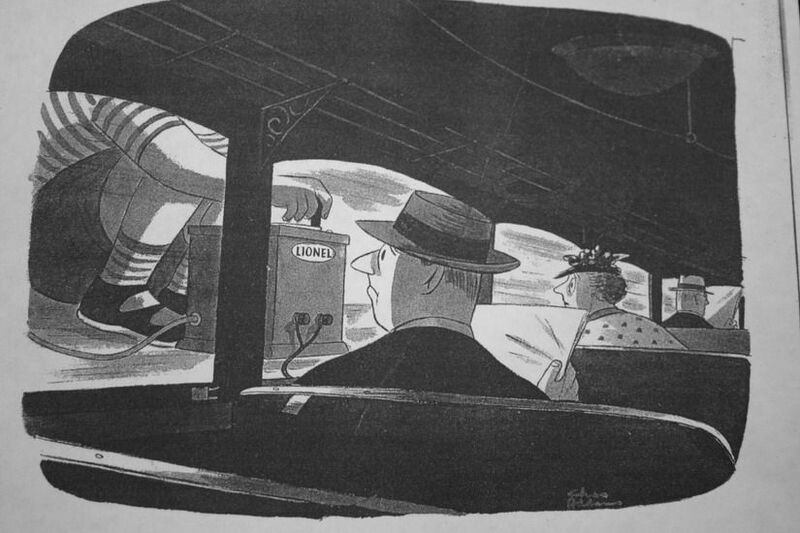 $1.00 in 1958 is about $8.12 today, adjusted for inflation. 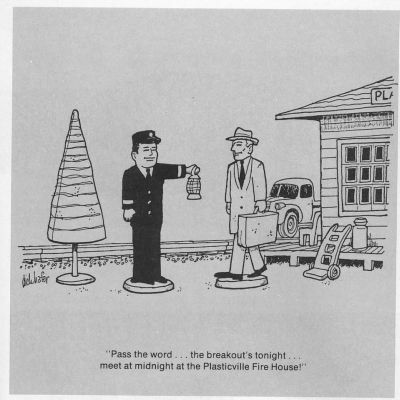 If you bought new Bachmann production of the motel (45618), it would cost you $25.00 - and you wouldn't get the shrubs. 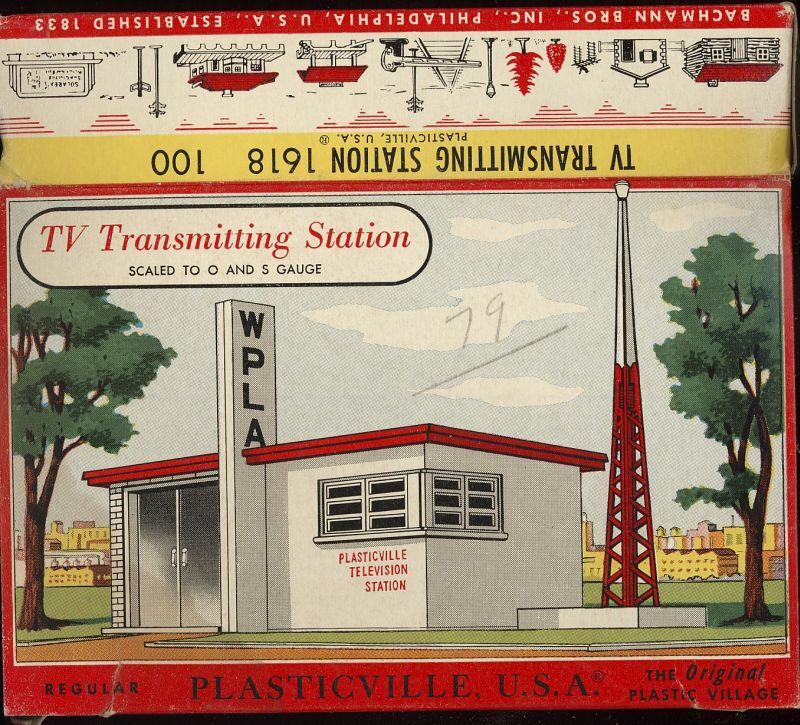 Here is the Plasticville Collectors Association web site. I'm a member. This Aliquippa store is where most of my trains were purchased. They had a giant selection of trains around Christmas and one section of their store window was always dedicated to trains. 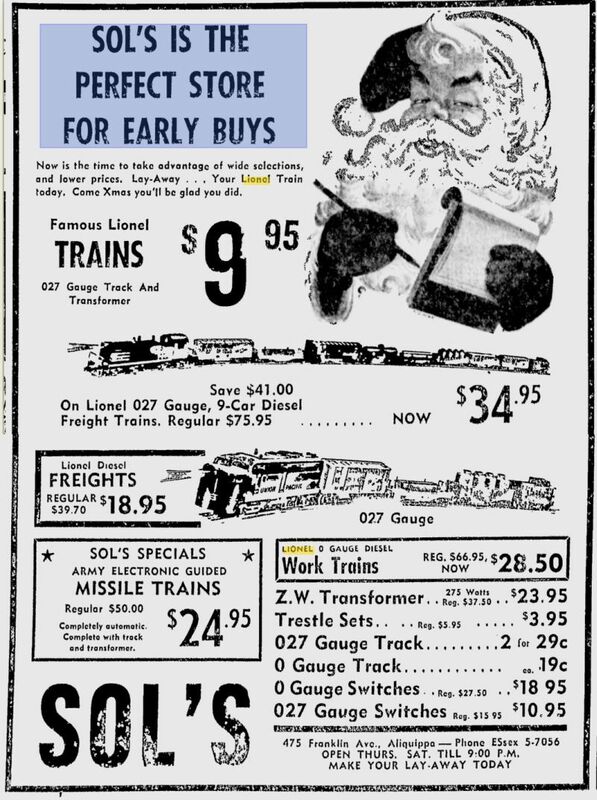 This advertisement from the 27 Oct 1959 Beaver County Times - boy, talk about getting an early start on Christmas. 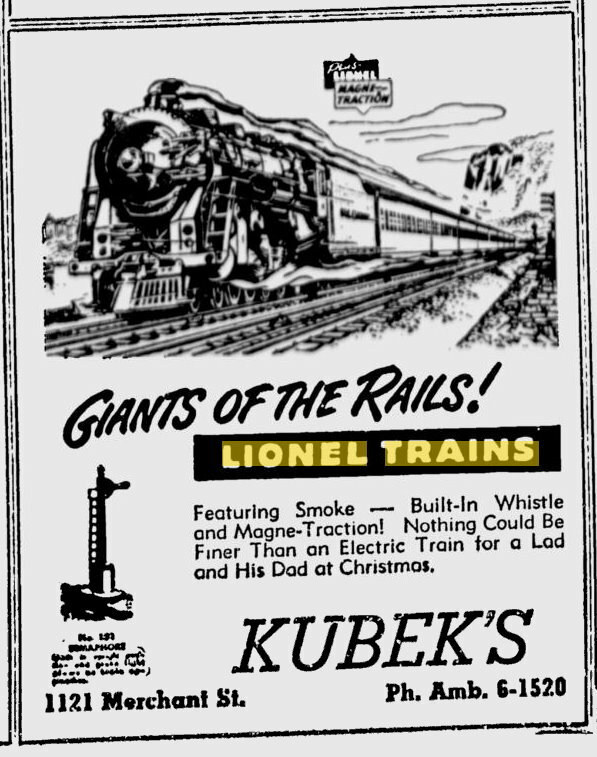 Kubek's in Ambridge, PA was one of the good stores for Lionel Trains. I bought parts from them up into the 1970's. This store was not around when I was a kid. 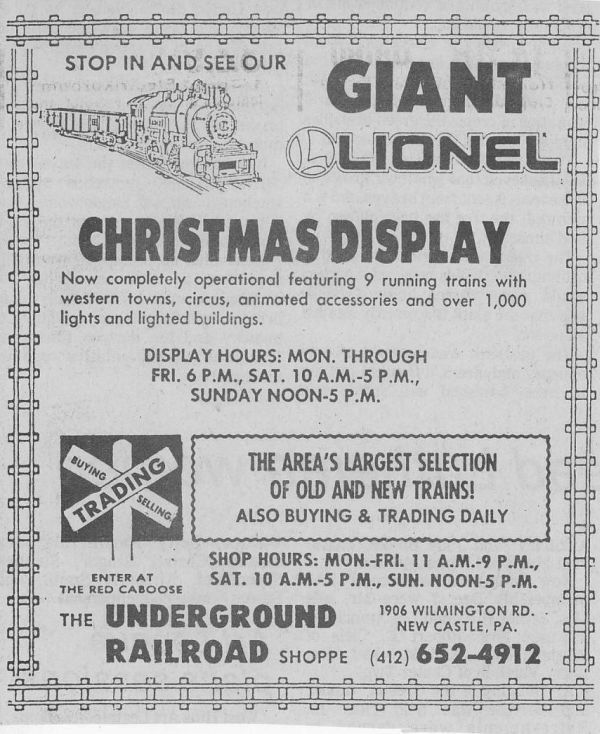 This advertisement is from the 26 Dec 1986 issue of the Beaver Valley Times. I visit them now every time that I'm back in the Western PA area. In April of 2013, I got up into the attic of my home from the 1960's. 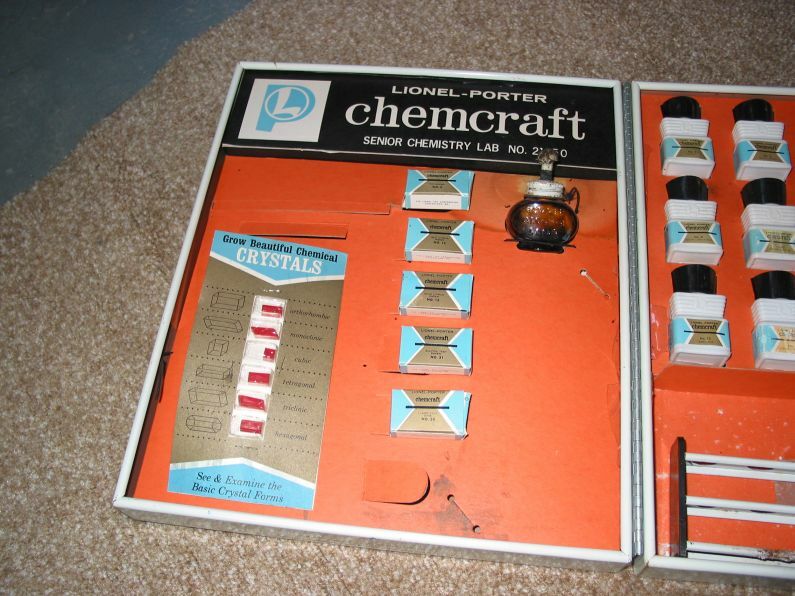 I found this Lionel-Porter Chemistry Set. I had totally forgotten that I had it. It has to have been up in the attic since the middle 1960's. From Wikipedia: "As part of this diversification, Lionel formed a relationship with the Porter Chemical Company, whose owner Harold M. Porter was a member of the Board of Directors of Lionel. 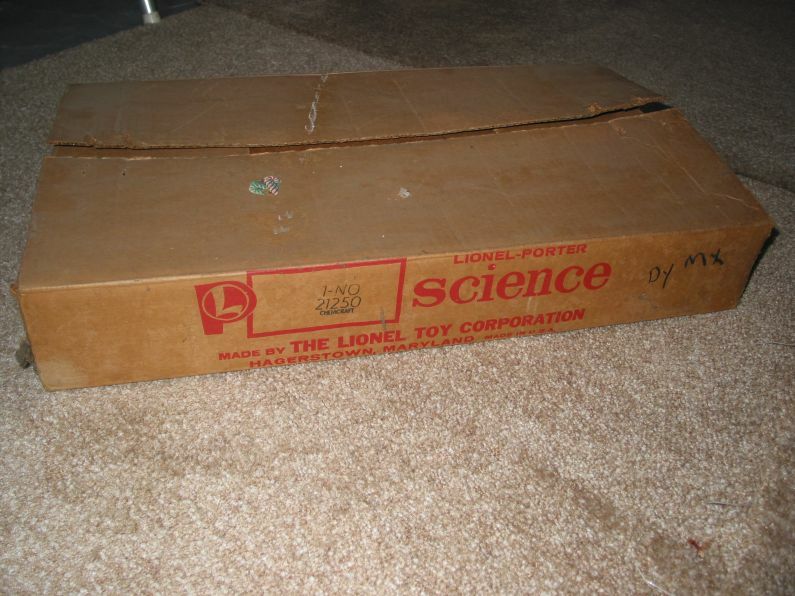 Lionel began making a variety of scientifically oriented, hands-on educational toys, designated "Lionel-Porter." 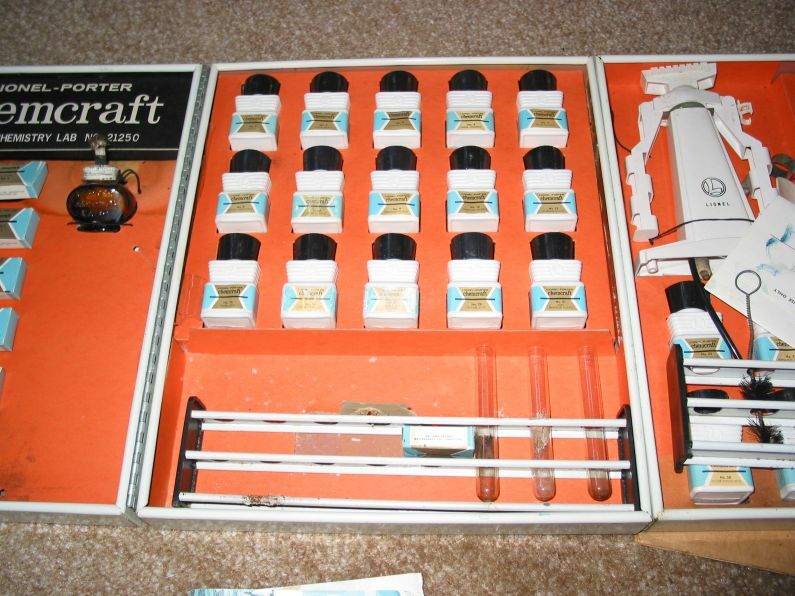 The product line, cataloged from 1961 to 1968, included Chemcraft chemistry sets, Microcraft microscope sets, Biocraft biology sets, and sets teaching about mineralogy, physics, geology, mathematics, and industrial science, along with a junior line of tool sets." Porter Chemical Corporation, founded in 1916, was located in Hagerstown, MD. So 40-some years in an unheated attic. The colors on the front were still vibrant. Inside the contents were a little rough. 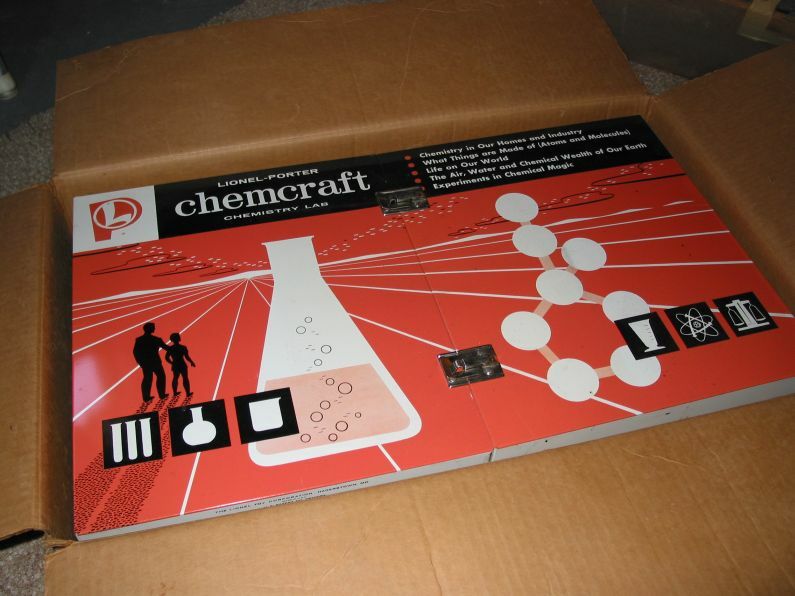 I didn't look inside the bottles of chemicals. Looks like many test tubes were missing. Some of the metal tools were rusty or maybe its the result of some chemical reaction. The book by Linn Westcott on building model railroad benchwork is out of print. You can find used copies for sale on Amazon or you can get the newer book "Basic Model Railroad Benchwork" from the Kalmbach Bookstore link above. That book describes the L-Girder Framework which is the basis for Westcott's book.